I am a huge fan of CrazyDog Tshirts! They are a great company that has tshirts for every occasion or no occasion at all. Whether you want to celebrate a holiday or just have a funny saying on your tshirt, they have a style for you! With Valentines Day behind us, the next celebration heard across the world is St. Patrick's Day! Whether you're Irish or not, people all over join together to celebrate all the luck of the Irish with green beer, corn beef and cabbage and more. I'm not Irish, but every year I get dressed in green and make a traditional Irish meal. Along with some green beers, it's always a blast! Last year I wore a tshirt that says, "Stop staring at my leprechauns!" This year, it's all about St. Patrick's Day Tshirts! I'll show my pride through my tshirt! 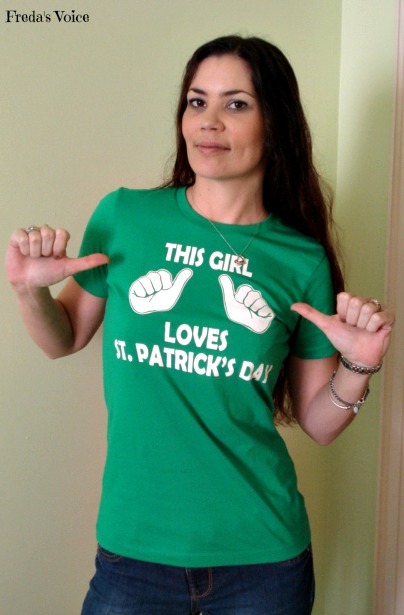 It's really lovely, and though I am Métis, I can still show my St.Paddy's pride! I love the feel of the shirt, which is 100% cotton. It also washed well, not losing any color, and didn't shrink in the dryer. I can't wait to get it on and paint little shamrocks on my face, drink green beer and have a blast on St. Patrick's Day. What will you do? Will you browse the tshirts and show your pride that day too??? Visit CrazyDog Tshirts on Facebook or on Twitter. DISCLAIMER: I received a tshirt for review. I was not compensated. All opinions are my own.